Antenna Magus version 3.3 released! Antenna Magus Version 3.3 introduces some very exciting extensions to Antenna Magus. Many improvements to the Antennas and Models that are already available. New export functionality allows export of Antenna Magus models to AWR Design environment. This new capability was announced at European Microwave Week 2011. Antenna Magus users can export certain planar antennas directly to AWRDE for analysis using the AXIEM solver. 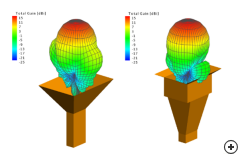 As with all Antenna Magus export models, the AWRDE models are fully parametric - with a number of them using specially developed PCELLS to provide flexible geometries that are otherwise not possible to create parametrically. These parametric models can easily be integrated into circuitry and optimized together with other parts of the system. Image of the Compound box pyramidal horn antenna. 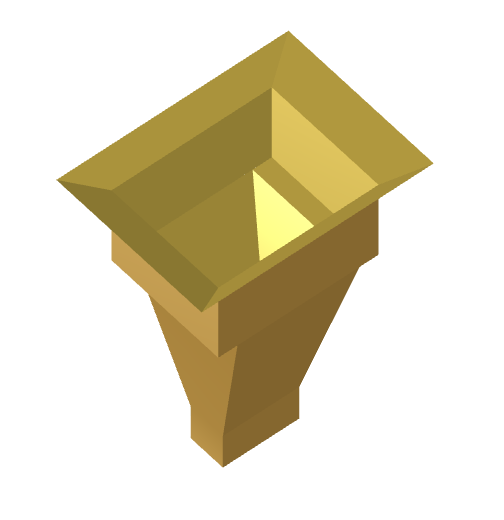 The classical pyramidal horn antenna supports a single propagating mode (TE10) that generates a field distribution (magnitude) across the mouth or aperture of the horn similar to the profile shown in the figure below. The radiating aperture of the horn is therefore only partially exploited, resulting in aperture efficiency in the order of 65% relative to an ideal aperture excitation. One way to improve the efficiency of the aperture excitation of a horn antenna is to use a structure that supports multiple modes. The compound box horn is one simple modification of the pyramidal horn antenna that includes a step and a short un-flared box section that couples some of the energy in the TE10 mode to the TE30 mode. The length of the box is designed such that the TE10 and TE30 propagating mode components reach the waveguide-to-flare transition of the horn 180° out-of-phase, resulting in a more even aperture distribution and an improvement in aperture efficiency (a typical box-horn has an aperture efficiency around 82% relative to an ideal aperture excitation). 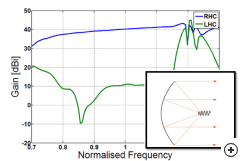 Antenna Magus allows the compound box horn to be designed for gain or beamwidth at a specific operating frequency. 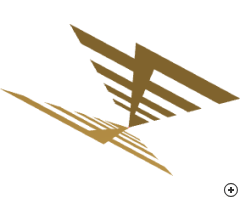 The feed waveguide dimensions are chosen based on the operating frequency and can easily be tweaked to specific standard waveguide sizes after design with minimal effect on the radiation performance of the antenna. 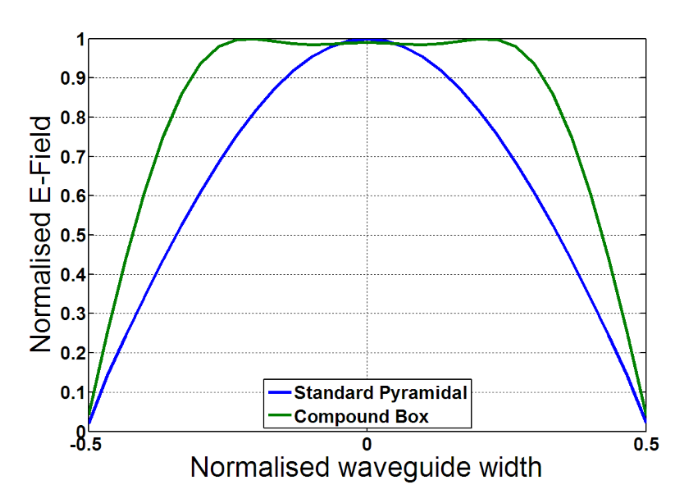 The comparative field magnitude across the waveguide section at the start of the horn flare in a pyramidal and a compound box horn. 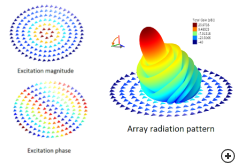 A concentric circular array design showing the element excitation magnitude and phase and the resultant synthesised radiation pattern. A new class of Array layout has been added to the Array Tool in Antenna Magus. 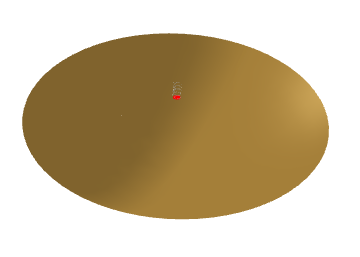 The concentric-circular array class is specifically aimed at generating radiation patterns that are rotationally symmetrical around the boresite direction of the array, independent of the steering angle of the main beam as shown in the image below. 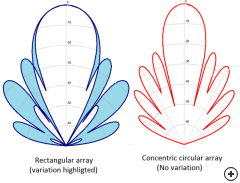 The advantages of the pattern symmetry become clear if one compares a concentric-circular array to a rectangular array with similar performance in the primary cut planes. The images shown below were generated by overlaying multiple pattern cuts with various azimuth angles around the boresite direction to determine the maximum rotational variation of the pattern. The rectangular array shows quite considerable variation, while the concentric-circular array shows no variation, providing for better sidelobe control as well as more efficient array aperture usage. 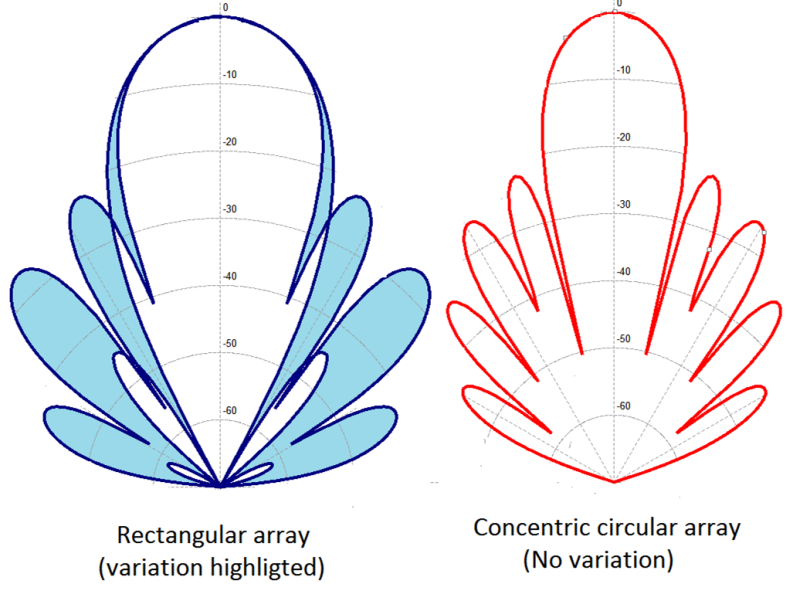 A comparison of the rotational variation around the boresite direction of a rectangular and a concentric-circular array layout. 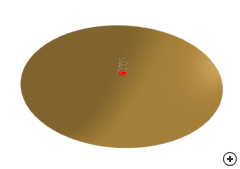 Image of the Backfire-helix-fed parabolic reflector . The backfire-helical-fed parabolic reflector provides an effective means of obtaining a high-gain circularly polarised radiation pattern using a relatively simple and low-cost feed structure. In most instances, the helical feed may be held in place by a simple on-axis supporting post, circumventing the need for feed strut braces. The design and placement of the backfire helix feed is critical. By using a small ground plane and selecting the pitch angle and number of turns of the helix correctly the required beamwidth of the backfire radiation to illuminate the dish can be achieved. 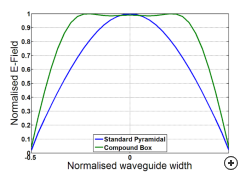 The practical beamwidth variation range is relatively small when compared to a horn feed, limiting the range of F/D ratio parabolic reflectors that can reasonably be used for this kind of feed approach. In practice, the coaxial cable used to feed the helix would be fed along an on-axis support post from the center of the reflector - for physically smaller antennas at higher frequencies, a semi-rigid feed coax may even provide the actual support for the feed element. The exact placement of the feed is typically adjusted experimentally during construction to ensure ideal placement at the focal point of the reflector. 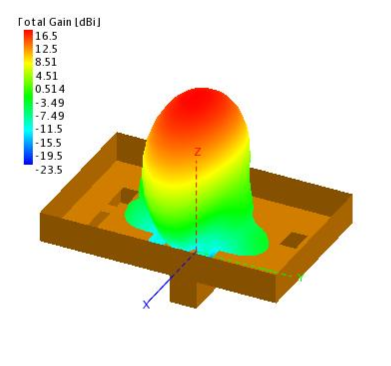 Antenna Magus allows this antenna to be designed for gain or beamwidth at a specific frequency. 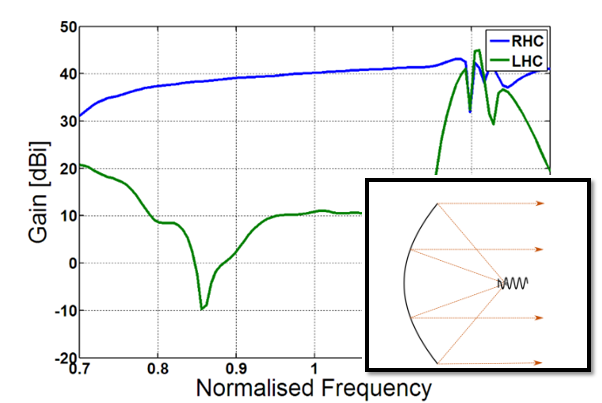 The on-axis circular polarisation performance of a typical backfire-helix-fed parabolic reflector antenna. 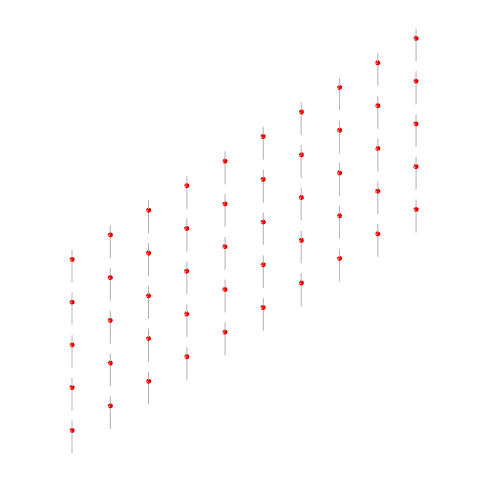 Image of the Cylindrical dipole in infinite array. The simple wire dipole is a ubiquitous antenna, familiar to anyone that has ever attended a course on antennas or considered electromagnetic radiation. The design of these structures is deceptively simple - each arm should be just a little less than a quarter-wavelength long and driven in anti-phase to provide a linearly polarised radiator with 73 Ohm input impedance. When the basic dipole is used in an array, however, the close proximity of the elements in the array causes interaction between elements, altering the currents (and thus impedances and radiation characteristics) of each element. This interaction, or mutual coupling, affects the way that the element should be designed, both in terms of the length of the element arms and the anticipated input impedance. 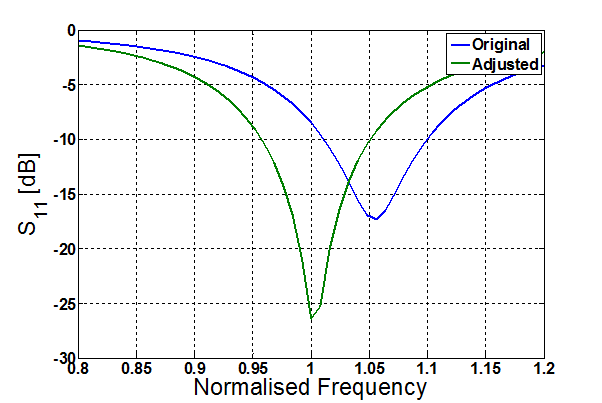 The figure shows the comparative reflection coefficient of a dipole in an array environment when designed for single element usage (original) and when adjusted for use in an array (adjusted). 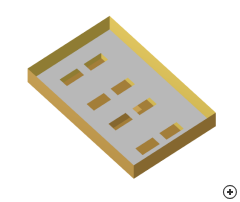 The input impedance of the dipole in the array is designed so that it performs as though it were a single isolated element. Comparative single element reflection coefficient of a dipole designed for single-element operation and a dipole designed for inclusion in an array. 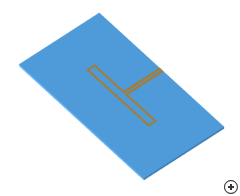 Image of the Printed folded dipole. 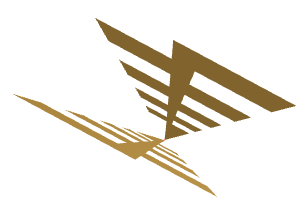 The typical radiation pattern of a folded planar dipole. 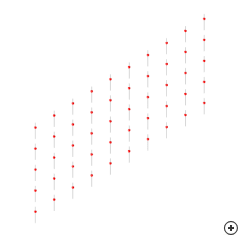 Antenna Magus Version 3.3 sees the introduction of 3 new approximation tools to the Toolbox. These approximations are exceptionally useful in making good design decisions in the earlier stages of a system development, where the exact details of antenna topologies, system properties and other implications are not yet clear. The first tool implements the Radar range equation - which relates the transmitted and received power in a radar system given the target size and distance from the receive and transmit antennas. This relation can be used to consider the system level requirements and performance capabilities of a bi-static radar system. 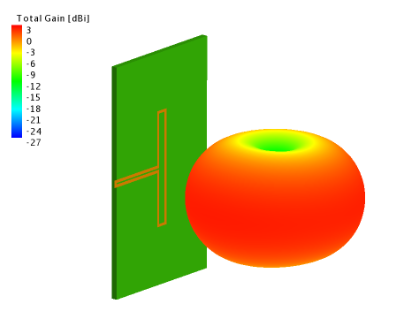 The second new tool predicts the approximate gain of an antenna, given the mainbeam beamwidth, or vice-versa. The method used for this approximation is based on theoretical or idealised models that are adjusted based on observation of practical or realistic radiation patterns. Finally, a tool has been added that calculates the expected gain given the area of an aperture and the efficiency with which that aperture is exploited. The calculation is based on the equation below, which is derived in most textbooks. Formula used to calculate the gain, aperture area and antenna efficiency parameters.